We all know the phrase “when life gives you lemons, make lemonade”. For those who haven’t heard it (seriously?) it means when something bad or bitter happens, add some sugar and make it sweeter; make your life better by using the event to your own advantage. I’m not a huge fan of lemonade, real or the synthetic, fizzy stuff but I do like lemon curd. Husband likes it so much he’s known to eat it from the jar by the spoonful. Lemon curd yogurt is also a massive hit so it was a fairly simple plan for this afternoon – make lemon curd. 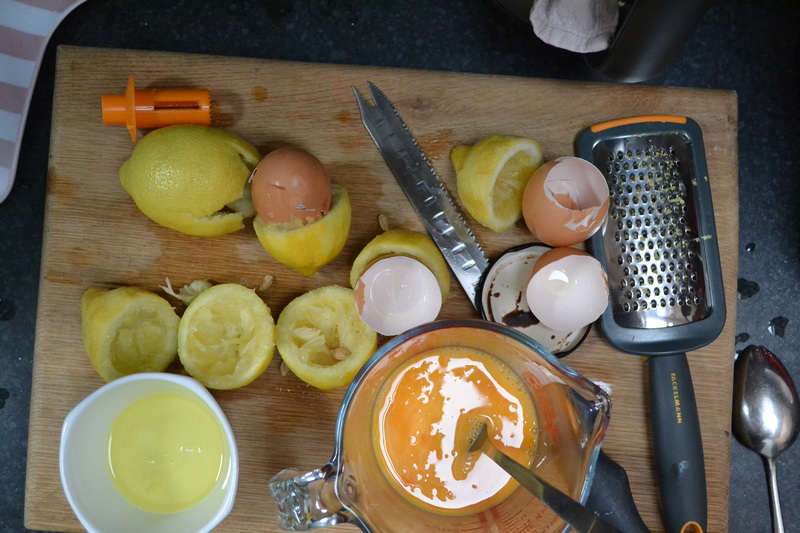 To the uninitiated, lemon curd is a soft spread made from lemon juice, sugar, eggs and butter. It’s particularly good spread on hot toast or crumpets or swirled through Greek yogurt, as a filling for lemon sponge and in the ever-present 80’s favourite, lemon meringue pie. I always thought it was devilishly difficult to make, given you need to mix raw eggs into a hot butter and sugar emulsion and stir until the heat of the butter mixture cooked the eggs and turns into a thick, custardy textured mass. I did attempt it once before and it resembled scrambled eggs with lemon zest…gross beyond pictures. This time however, I turned to a legend of British cooking. Not Delia or Nigella or Jamie but someone much quieter and less keen on the spotlight – Nigel. Nigel Slater to be precise and his recipe in the Guardian online from 2010. I’m sad to say I have no books by Nigel Slater but I’ve used his online recipes and on one memorable occasion, had a brief Twitter exchange with him after making his Chocolate Beetroot Cake – my kitchen resembled a war zone and I tweeted that I hoped it was worth the mess. He replied and I did what most normal adult women would do – squealed, hyperventilated and then spent 15 minutes telling anyone who would listen what he’d said. Surprisingly, no one was that interested. So without further ado, I give you Nigel Slater’s Lemon Curd. Follow this to the letter and you can’t fail. It makes just under 2 Bonne Maman standard size pots. 3 whole eggs and 1 extra egg yolk. Place the juice and zest of the lemons into a heatproof bowl. Make sure you only get the lovely yellow of the zest, not the bitter white pith underneath. I used a micrograter but anything that gets the zest into tiny pieces will do. Add the sugar and cubed butter and place the bowl over a pan of simmering water, making sure the bowl doesn’t come into direct contact with the water. Stir with a whisk until the butter has melted and the mix becomes bright yellow. Mix all the eggs briefly with a fork in a jug and then pour a slow and steady stream into the butter and lemon sugar mix, stirring all the time with the whisk. Now, the patience part – over the next 10 to 15 minutes, allow the heat of the butter mix to cook the eggs, stirring frequently to ensure the mix doesn’t scramble or congeal on the bottom. The mix will thicken and turn a deeper shade of yellow – don’t be concerned that it looks slightly orange at first. This all depends on how yellow the yolks of the eggs are. When thickened to a custard consistency (pourable but no longer actually liquid), remove from the heat, take the bowl off the pan and allow to cool slightly, stirring occasionally with the whisk. Pour into sterilised jars (I washed mine, dried and baked in the over at 130C for 20 minutes) that are still hot. 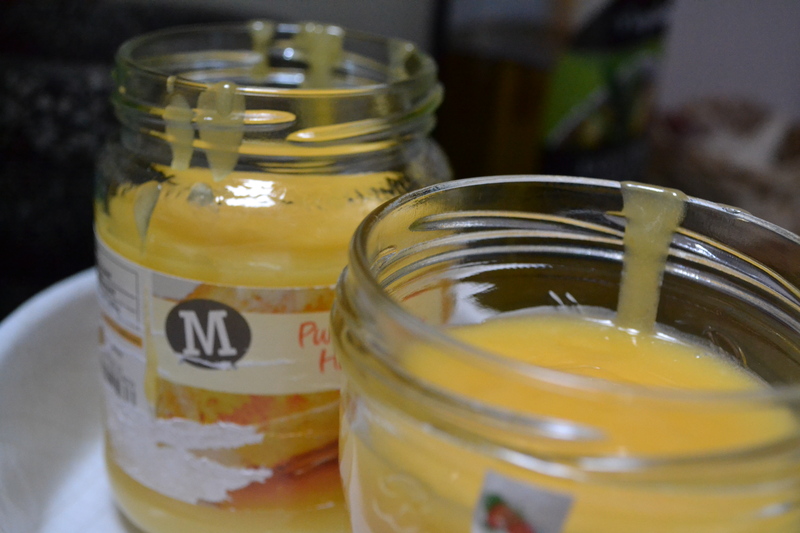 PLEASE NOTE: don’t pour cold curd into hot jars or vice versa – it could cause them to crack/smash. Place a circle of grease proof paper or a waxed disc on the tops and allow to cool before sealing with the lid.